Cracks in block foundation walls and large crack on concrete basement floor in recently purchased cottage. Looking to seal the cracks before installing proper drainage on the exterior. The foundation of our home appears to be sagging on one side and pulling the floor apart. We believe our house is a Viceroy house and the joists were not put together correctly. During the recent thaw, we found a few inches of water in our crawl space under the cottage. Not sure if we'd need a temp pump (this is our first year there but apparently this doesn't happen often) or a more permanent solution. Could we schedule your stopping by for letting us know what options you'd recommend? Previously incorrect insulation installation. Insulation needs to be removed, rim boards spray insulated and ground barrier. Have a 20 year old home and the crawl space is 26' x 56' feet with approx. 3.5 feet tall walls. The concrete block wall are on foundation on grade and have 4 inches of foam insulation and the floor has a rough layer of concrete on sand base. The forced air furnace and ductwork is also in the crawl space. With the floor pretty much on grade, I'm thinking the cold from outside is transferring under the concrete floor causing the crawl space to cool down . Wondering if you have run into this problem and if there is a fix? We not only adhere to the highest industry standards, we strive to be the industry leader in the home improvement related services we provide. We also use state-of-the-art products and technology which are designed to fix your home. 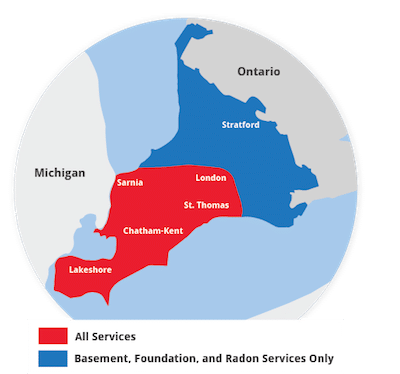 We are the authorized Basement Systems dealer in Lambton Shores, ON. SmartJacks help support the home's structure. A new beam was installed and SmartJacks for support. Dry rot was evident in some beams and joists.